During the summer of 2014, five Princeton student-athletes were selected to travel to the Phung Hiep District of the Hau Giang Province in southern Vietnam to volunteer for Coach for College, a global initiative aimed at promoting higher education through sports. These student-athletes taught academics, sports and life skills over the course of three weeks to disadvantaged youth at the Hoa An Secondary School. The Princeton Varsity Club provided funding for the majority of the necessary expenses associated with the charitable service trip, with the remainder of the funds being raised by the individual participants. The PVC sat down with each student-athlete to learn more about their educational experience this summer. Our first conversation is with Morgan Hallock ’17 (water polo). Before I left for Vietnam, I was expecting a very rural experience. I had looked at the website and read a lot about the program and got the impression that we (the coaches) were going to be a huge part in these kids lives academically and athletically. More than that, I expected to be thrown outside my comfort zone, which I was nervous, but excited for! Everything about life over there was very different from what we are used to in the United States. Everything was less sanitary and there were a lot more bugs constantly around. It was clear there was a lot more poverty, and even in big cities there were many poor areas. The food was more organic. Everything that we ate we most likely saw alive or fresh on the street earlier that day, and water was not as readily available as it is in the US. Can you tell us about what a typical day was like? We started the day early with some breakfast—usually stew or noodles—and rushed over to the school to start lessons at 7:00am. From 7:00am until 11:00am, each coach taught two academic lessons, two sports lessons, and a life skills class. We went back to our home for lunch, cooked by the owners of the home, and a quick nap. By 1:10pm we were back at the school for another five lessons. We went back to the home for dinner, a shower, and then a group meeting at 7:00 PM to plan the next day’s life skills and sports classes. How did the language barrier effect your teaching/coaching strategies? I expected the language barrier to be way more difficult, but the Vietnamese coaches were brilliant and very hard working all day long to translate the best they could for us. Teaching English, it was also comfortable for me to be able to practice English with the kids outside of class. Going into the program, I never expected to make such great connections with the students as I did. By the third week, not only did we get along inside the classroom, but we connected outside as well. By the time the program was over, all of the American coaches were joking around about who we would sneak back to the US with us because that’s how connected we were to the kids. They looked up to us, they trusted us, they were inspired by us, and they loved us; and by the end of the trip, I felt the same way about each student there. They are all brilliant and inspired to work hard because they know the only way to a better life is through higher education. What is your favorite memory from the trip? Other than the camp during the week, some of my favorite memories were the trips on the weekend. We traveled to Ho Chi Minh City, Hue, and Hoi An. From pagodas, to beautiful beaches, to crowded markets, each weekend was such an adventure and an amazing opportunity to see more of Vietnam beyond our home in Da Nang. I definitely saw the world in a new light and the program has sparked my interest in going abroad more and seeing more of the world. What is the most important thing you learned/realized from this opportunity? Being at Princeton, sometimes we have such an inward view and worry about our own success and how to get there. Through this trip living and teaching abroad I saw the pure inspiration that the children had from just being able to know a college student. Many of these kids will be faced with the hard choice of pursuing their education or taking the common road of helping their family business, and the fact that I could make an impact on their lives inspires me to continue to improve my world view and improve the world’s view at the same time. I am such a proponent of this program and it absolutely transformed my idea about the world and being a Princeton student. It was a perfect amount of time to be abroad and immerse in the culture, but at the same time, be able to not spend too much time away from home. 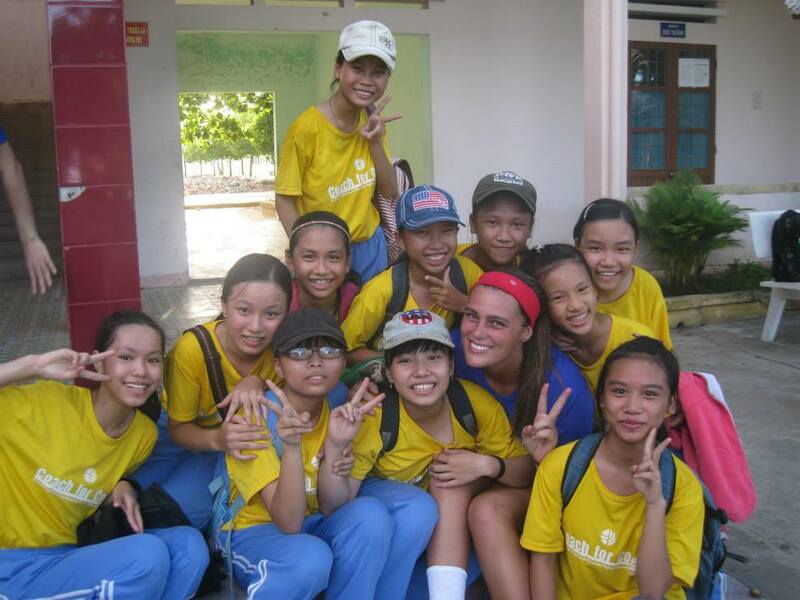 You will make so many unlikely friends in the American and Vietnamese coaches as well as the students. To see more photos from Morgan’s trip, click here.